Scarlets coach Wayne Pivac says he would be interested in talking to full-back Leigh Halfpenny "if he is serious" about returning to Wales. Halfpenny's contract at Toulon ends in summer 2016, with Cardiff Blues reported to be interested in re-signing the player. The 26-year-old left the Blues for France in the summer of 2014. "He's no different to anyone else. If he is serious about returning we'd be interested to talk to him," said Pivac. "We don't have an endless budget, but I've said it earlier and nothing has changed. "If there's any returning Welsh players we'd like to have the opportunity to talk to them just to check what's going on in the market-place and find out their value." It is likely any return to Wales by the 2013 British and Irish Lions full-back would be on a national dual contract funded 60% by the Welsh Rugby Union. Under the terms of the agreement between the four regions and the WRU, the player's region of origin would have first refusal on a player returning to Wales - suggesting the Blues would be favourites. However, flanker Dan Lydiate opted for Ospreys ahead of his old region Newport Gwent Dragons when he returned to Wales from Racing 92. Another factor could be whether Halfpenny could join a region that qualifies for the 2016-17 European Champions Cup. Scarlets and Ospreys are Wales' representatives in this season's tournament, and the Blues will have to show a marked improvement in their Pro12 form to qualify for next season. With Halfpenny having won the tournament with Toulon last season, the chance to play in Europe's premier club event could be a major lure. After watching his side beat Zebre 20-12 in the Pro12, Pivac also said the Scarlets are keen to hold on to club captain Scott Williams. 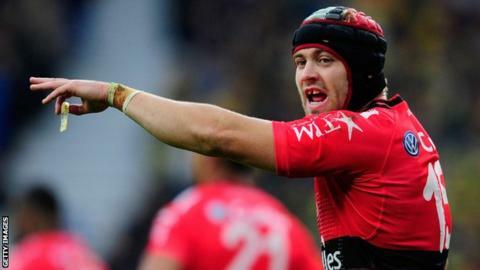 The Wales centre - like Halfpenny - is currently out of action after surgery. Williams is already on a dual contract, which runs out in the summer of 2016. "I know he's contracted until the end of the season and hopefully we'll get some rugby out of him in that time," said Pivac. "There's lots of things happening behind the scenes at the moment and I'm not really in a position to give you anything that hasn't already been given out in a press release. "Scott is our vice captain, one of leaders so we certainly don't want him going anywhere."